What’s the cost of a dirty workplace? It has been well-documented that the typical office desk has more than 10 million bacteria, (which incredibly is 400 times more than a toilet seat), many people don’t wash their hands and most surfaces are officially dirty. So, besides the obvious potential impact on our health, given our inbuilt negative response to dirt, what effect do dirty environments have on our heads? For a start, in offices, most surfaces are officially dirty, with the usual suspects of taps, microwaves, keyboards and fridge doors being the worst where viruses can survive for hours, days, weeks or months. Given the prevalence of open plan offices and hot-desking, or shared desks, this all adds up to more sick days – workers in open plan offices have a 62% higher absence through illness incidence than others – as germs have an impact. Of course, while we all know that if we’re sharing a workspace, we should clean it and the shared equipment when we’ve finished with it, fewer than half of us do. The trouble is, how we’d like to behave and how we know we should behave is often quite different from how we actually do behave. After all, if the place is dirty or untidy, how many of us selflessly clean it up for everyone else? We’re actually just as likely to be as untidy and dirty as we perceive everyone else to be – even if we think we’re not. So, what effect does a dirty, messy workplace have on employees? One study suggested that the cleaner the environment was, the more satisfied the employees were. Another set of experiments suggested that a neat, tidy, clean and ordered workplace engendered positivity and trust within organisations, and in yet another study, researchers found that there was a 12.5% decrease in absence due to days off sick and a tangible increase in productivity if the environment was clean. It appears then, that it’s no coincidence that a cleaner workplace has fewer staff absences and higher productivity. Wash your hands, use hand sanitiser and take responsibility for cleaning your workstation. Share ownership of the problem, share responsibility for the solution, keep the germs at bay and have a healthier more co-operative workforce. 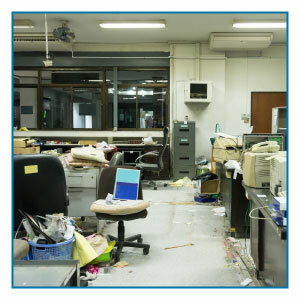 ServiceMaster Clean provides exceptional commercial office cleaning in the North West. To discuss your cleaning requirements with our experts, please get in touch.